Today we're bringing investors one of the best gold stocks to buy as both gold prices and gold stocks continue to smash the market. The price of gold is up 27.1% so far this year. The SPDR Gold Trust ETF (NYSE Arca: GLD) – the bellwether for gold stocks – has also surged 26.3% in 2016. Those gains beat the S&P 500's 7.3% rise over the same time. And even though most gold stocks are climbing, gold mining stocks are outperforming the rest. That's why Money Morning Executive Editor Bill Patalon just recommended one of the best gold stocks to buy in the gold mining sector. Gold mining companies extract gold from the ground and make up the majority of gold stocks on the market. 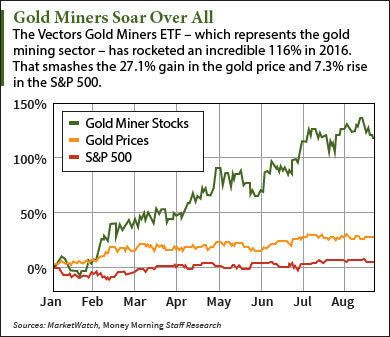 The Market Vectors Gold Miners ETF (NYSE Arca: GDX) – which tracks 50 gold mining firms – is up a huge 116% in 2016. Its top two holdings are Barrick Gold Corp. (NYSE: ABX) and Newmont Mining Corp. (NYSE: NEM). Both have gained a combined 320.7% this year. Of the 28 gold mining stocks with a market cap of $300 million or more, every single one is beating the S&P 500 this year. Not to mention 20 of the 28 have doubled in value and 10 of the 28 have tripled. "Truth is, the year-to-date gains for miners that produce gold have been incredible and have not faced any kind of a serious pullback," Patalon – a senior research analyst with over 22 years in the finance industry – said on Aug. 8. "When I wrote three weeks ago, I joked that an investor could pretty much throw a dart at a list of gold miners and pick a winner." That's why Patalon has repeatedly recommended one of the best gold stocks to buy in 2016. Shares of this stock are up a massive 54.2% this year, and they can surge another 49% in the next year. One of the best gold stocks to invest in right now is Goldcorp Inc. (NYSE: GG). Goldcorp mines and produces the yellow metal throughout the United States, Canada, Mexico, and South America. It's the fourth-largest gold-producing company in the world, with 107.8 tonnes last year. For Q2 2016, Goldcorp reported gold output of 613,400 ounces (17.39 tonnes). The company is also one of the most efficient gold miners on the market. When gold prices started crashing from their $1,876.90 peak in September 2011, Goldcorp was one of the few that started cutting costs. Capex costs are set to fall 36% from $2.2 billion last year to $1.4 billion this year. And it will keep cutting expenditures even as rising gold prices keep yielding profits. Over the next two years, Goldcorp plans to cut $500 million in corporate expenses and on-site mining costs. Its cost-cutting combined with surging gold prices make GG one of the best gold stocks to buy right now. "We're only in the beginning stages of a bullish gold market, and that means this miner has a bright future on the horizon," Patalon noted. The most bullish of analysts give the GG stock price a one-year price target of $26.50 a share. That's a huge 49% gain from today's price of $17.78. 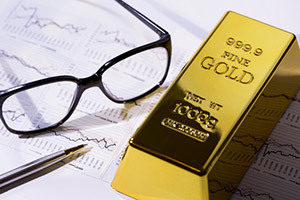 Stay tuned to Money Morning for more updates on gold prices and Goldcorp stock.